There are several parts to this series: This article introduces consumer "surveillance" technology as it applies to barns and horses. Hardwired and wireless barncam setups are described. Part 2 will cover putting your barncam on the Web (allowing you, and others, to monitor your horse from anywhere!). Part 3 will cover trailercams. 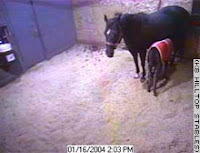 Mount the camera in the barn stall and plug it into a power source. Decide how you'll run the cable. You'll need a really long video cable--long enough to run from the barn to your house. Unless you plan to use it on an occasional/temporary basis, you'll need to find a permanent means of running the cable. For example, you can use PVC pipe to bury the cable in the ground. 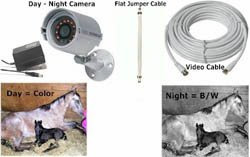 Connect the cable to the camera in your barn and run it to your house. You can use a flat jumper cable to go under a window or door. Connect the cable to the video/audio input of your TV or VCR. As you might guess, running the cable is the biggest challenge, and depending on the distance from house to barn and other environmental conditions, it may not be feasible. Wireless requires that you place the equipment in line of sight (LOS) from the home to the barn. The transmitter and/or antenna may have to be mounted on the outside of the barn or near a window. The receiver might need to sit at a window of the house. Did I mention line of sight? LOCATION LOCATION LOCATION. Of the transmitter and receiver that is. This is the single most important factor in making wireless work. Wireless transmitters can be standard strength (400-500 foot range) or more high powered for longer distances. High power transmitters are supposed to transmit for miles, but practically speaking, about 3000 feet is typical. Antennas may help with signal strength. If you don't know the distance from barn to home, find your property on Google Earth and use the tools to measure the distance. Analyze your property for possible sources of interference before you buy. So here is the setup for a wireless system. The camera, which may require a power source, is mounted in the stall. A 50-150 foot cable runs from the camera to a transmitter, which is likely mounted near a window or outside the barn. The transmitter requires a power source and should be weatherproof. At your house, ideally in line of sight from the barn, you should have a receiver set up. The receiver needs a power source. The receiver (pictured right) connects via cable to your TV, computer, laptop, or VCR. When everything is connected, configured, and powered up, you should be able to monitor your horse from your house. I won't go into this too much, suffice to say that cam options are varied: wide-angle, color or BW, infrared (work in darkness), with or without audio, high or low resolution, etc. Don't skimp here, get the highest quality and highest resolution you can afford. A 480 line resolution is recommended. Note that in dark conditions, most color cams will revert to BW to maintain image quality. You'll pay about $350 for a black and white barncam and wireless system with a range of 500 feet. A more powerful transmitter (up to 1000 feet) and a color camera will put you at $500-$600. Infrared (night vision) capability is another $100. What are the most common mistakes people make in buying/setting up a system? The most common mistakes are not getting the proper camera for your situation. Most people have metal sided barns, or barns with metal roofs. Standard cheaper systems will not work with these types of barns. The main reason people might be dissatisfied with a system is that the cheaper systems use low quality cameras and low power wireless transmitters which are not made for use in the barn. Systems should have all steel housings, high powered transmitters, wide angle lenses and audio. They should be made specifically for barns/farms. (THANKS to Bill Thiel, Saddlebrook Barncams, for this answer). Aside from the lower cost, why would I want a black and white system? Black and white systems may provide a better quality picture overall and will produce pictures in lower light conditions than color systems. What kinds of materials can interfere with a signal? Metal barns, metal roofs on barns, tempered glass, vinyl coated aluminum siding, insulation with foil backing, thick trees, and metal blinds. What are the advantages and disadvantages of the different frequencies? As the frequencies increase quality of transmission increases. However, as frequencies increase accuracy of delivery becomes more critical. While the higher frequencies offer higher quality, reliable delivery of the signal will depend more on good placement of the components. (THANKS to Bill Thiel, Saddlebrook Barncams, for this answer). Can I record to a VCR from a wireless system? Yes. The RCA plugs go into your television set are the same type used in VCRs and DVD players and recorders. 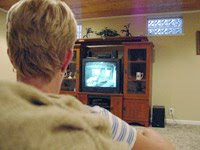 You can connect directly to a VCR or DVD recorder to record transmissions. IR is infrared and allows the camera to operate in total darkness. Infrared pictures are always in black and white even if the camera shows color during daylight conditions. What frequencies will operate wireless camera systems? Wireless cameras are available in 900 Mhz, 1.2Ghz and 2.4Ghz frequencies. Systems that operate at 5.8 Ghz are now becoming available. What are some of the companies that provide barncam solutions? In preparing this article I talked to Riverwind Surveillance Supply and Saddlebrook Barncams. While I didn't purchase from them, they were terrific -- responsive and knowledgable, but also willing to educate. You only have to look at their web sites to see they really like their work and know their stuff. Smartpak Equine sells a barncam and they've always had good customer service. Other companies are out there, and they may be fine. But there are many of them and none really stood out like Saddlebrook and River Wind. You can also assemble your own system, and it might be cheaper. Do your homework and make sure you know the equipment to avoid disappointments, or you'll end up doing it over and there goes the cost savings! In the next part of the series, I'll cover the dream-scenario of working horse moms -- monitoring your horse via the web.